We are glad to announce our latest feature which automatically generates, for every candidate, an anonymized version of their resume. On these files the name, picture and other personal information of the candidate are hidden. 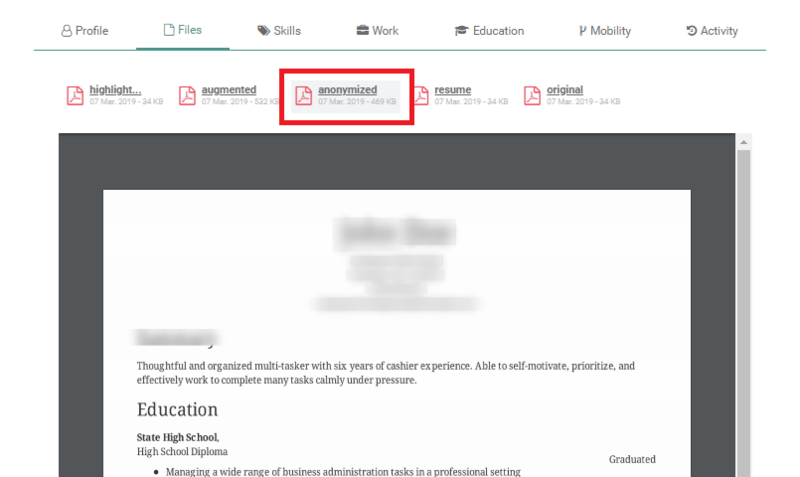 It's very simple to access the anonymized resume of a candidate using Riminder's platform. Just chose a profile on the main feed, and go to the Files tab, then you'll find the anonymized resume file under the name "anonymized". You can click on it to view or download. The anonymized version of the resume is also available through our API service. This new feature is an effective tool for reducing recruitment biases and establishing a much more fair screening process. It also gives recruiters the ability to process resumes without compromising the privacy of candidates' personal data, and without infringing GDPR laws. These are just some of the use cases for the anonymized resumes feature, which you'll find to be very useful and effective in solving different recruitment problems.